This summer, maybe even sooner depending on how fast I’m able to fix this, I wish to take the process outside. I’d love to make landscapes with this. Not only will I have to take my camera outside but also the entire darkroom and that’s the fun part. So, currently I’m slowly going through all the options of a portable darkroom/camera/working solution that I can actually carry and set up on my own. A van would be the most convenient. Also the most expensive per month here with the taxes etc etc. So, no go. I want to attach it to my bike so I can go places. There are blue prints of wooden darkboxes but they’re kind of heavy and lug for the size of plates I’m working with. Of all options one that seems suitable to me is a tent. It’s actually a portable “grow tent” for weed. Here’s one advantage to living in the Netherlands 😉 It’s perfect light tight, has ventilation holes, is very sturdy made (depending on brand of course) and is easy to set up and take apart. I think even I can do that. And you can get in and out very easily via a sort of zipped door. Oh, and the price is very reasonable too! They’re around 120 – 150 euros per tent and their size will be around 120 x 120 x 200 cm. So, I hope in a not too long a period I will have gotten myself such a tent, a table and some common sense to start manufacturing what I need from it. I’ll need to make some holes in it which I then cover with a red plastic to let in the non-harmful light. I’ll have to find a perfect sized table and a way to keep the tent stable when wind wooshes around it. That happens in these lands. If the tent is too big, i.e. catches too much wind, I’ll simply use half of it which I’ll stick to the table in a way. I’ll make it work! Next issue is the fixer. I now use Sodium Thiosulfate. Nice fixer, works very well but the plates need a whole lot of water; half an hour of running water. Well, nature just doesn’t have that everywhere. And keeping the plates wet for hours is not such a smart idea and letting them dry to rinse them properly at home isn’t either. So, that kind of forces me to use a different fixer; Potassium Cyanide. That needs hardly any washing time, the fixing process is very fast, it’s just that it’s very poisonous. I can make it work, just have to take extra precautions etc etc like ordering a special fixing box as I now use for my silver bath. Anyway, that’s how it stands now and I hope the process will work out just fine! This entry was posted on January 20, 2010 by Contrastique. It was filed under Wet Plate Collodion-Process & Chemistry and was tagged with maastricht, wet plate collodion. I’m still looking for something relatively portable for a darkroom. I know Ray at Star Camera is supposed to make a much more portable version than what is sold at Black Art Woodcraft… even though that is what Quinn recommends. I’d love to make landscapes eventually though. I don’t know if I would sell them or if they’d just be for me though. Black Art is definitely a solid build and I get why Quinn recommends it, also over Ray’s stuff. Seen cameras of both makers and I know what I would buy. But the Black Art would cost me about $700,- including shipping so I’m looking for a cheaper alternative, besides the fact that that box will weigh quite a bit. The weight is what turns me away from wooden boxes although it’ll be the most stable of all solutions, I guess. Just have to adapt to that when I know where the weaknesses will be when I build my own system. I can’t find the darkroom on Ray’s site, he used to sell a couple I can remember not too long ago. I’ll just see where my tent will get me 😉 I’ll keep you posted via here! Cette tente c’est normalement utilisé pour cultiver des plantes de cannabis. C’est opaque, a des trous pour ventilation et c’est tres solide. Merci pour votre message et je suis content que vous aimez le blog! Si vous avez d’autres questions vous pouvez toujours faire. J’utilise des lampes d’une studio flash pour faire les photos dans ma studio. C’est ne pas optimale parce que la puissance de ces lampes est pas fort, 100W par lampe. Mon temps d’exposition c’est d’environ 30 secondes. Comme le collodion âgées la sensibilité est plus faible. Beaucoup de gens utilisent des lampes CFL à 6500° K, Je n’ai pas encore utilisé ces lampes. De nombreux beaux résultats avec ces. Hello there. Great blog. I was wondering how you went with the tent eventually? I am unable to source KCN and can only use Sodium Thyosulfate as that is all that is available to me in Australia. Have you experimented with this fixer at all outdoors? I would be interested to know. 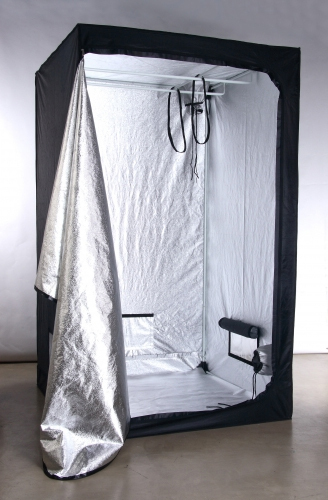 Sorry for the late reply… My tent still functions as my darkroom. I still need someone to help me set it up and close and open the zippers (still haven’t addresses that issue mostly out of laziness 🙂 ).